Four stroke, 90°-V-twin, DOHC, 4 valves per cylinder. With motorcycles more specialized than ever, you can now have an entire stable of machines (money permitting) and choose the one ideally suited to the task of the moment. Unfortunately, however, it's not so easy to take all of them with you on a multi-day ride. If you're looking for one motorcycle to cover lots of conditions — or if your budget limits you to one — there are few choices as versatile as the Suzuki DL650 V-Strom. I recently finished a week-long tour on the Wee-Strom (as many of its owners affectionately dub the smaller of the Suzuki V-Strom models) that would test the versatility of any motorcycle. The trip began with a 500-plus-mile day, mostly on interstate highways, from AMA headquarters in Ohio to New England. That was followed by a few days exploring from the Massachusetts coast to New Hampshire's White Mountains, on everything from four-lane highways to rutted dirt roads. Sometimes in the rain. In fact, during the course of the tour, I did just about every form of non-competition riding possible except for trails and a track day on a road course. And in the right hands, the V-Strom could handle mild trails and wouldn't embarrass itself at your local track day, either. With versatility like that, how can you go wrong? Well, only by choosing the V-Strom when another bike would better fulfill the demands of your personal riding mix. You see, the V-Strom 650 slots into its own niche in the growing-but-still-small adventure-touring category. It offers a lighter, less expensive alternative to the big rigs of the adventure-touring world, such as the BMW R1200GS or the KTM 950 Adventure, on the dirty end of the scale, to the Triumph Tiger and the bigger DL1000 V-Strom, on the street-oriented end of the range. 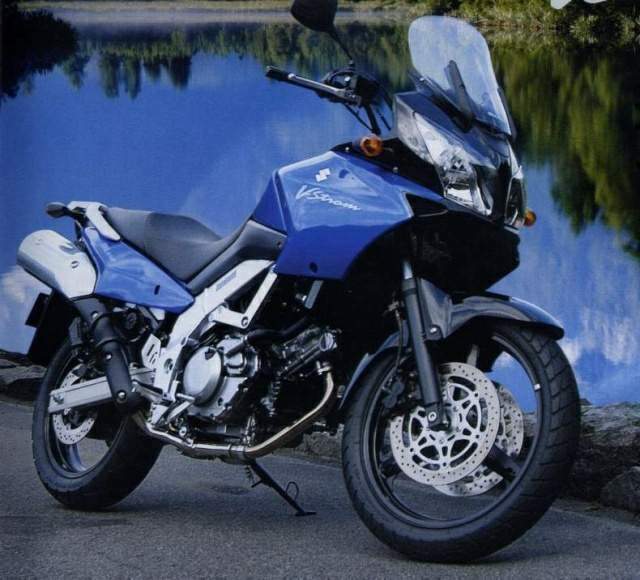 At the same time, the DL650 is more highway-ready than the dual-sport thumpers sometimes pressed into similar duty, such as the Kawasaki KLR650 or Honda XR650L, both last updated more than a decade ago. The smaller V-Strom hits this slice of the market with a package that mixes the sweet 645cc, 90-degree, fuel-injected V-twin from the street-going SV650 with a more upright, dirtbike-like riding position, wind protection from a big fairing, Bridgestone Trail Wing tires — dual-sport rubber with a street bias — and a generous gas tank. With 5.8 gallons aboard and the V-Strom's frugal fuel economy, it's easy to make 250 miles between gas stops without pressing your luck. This setup works quite well out on the highway. The V-twin has been retuned for more low-end torque in the V-Strom, compared to the SV650, and it provides a broad range of power. You won't get the high-end rush of a sportbike's four-cylinder, nor will you get the off-idle, tractor-like torque of a big cruiser's V-twin, but the lack of drama is deceiving. Power is available almost regardless of where the needle points on the tachometer. Another staffer who rode the bike complained about the frequency of the vibration at highway speeds. Personally, I never noticed the vibration, even after a 12-hour day on the bike. One person's annoying buzz is another's pleasant thrum (low frequencies bother me, for example, while most people can't stand a high-frequency vibration), but overall the 90-degree V-twin is a smooth powerplant. The fuel capacity and the upright riding position, combined with the fairing’s generous wind protection make long, uninterrupted highway runs possible. The windscreen is adjustable — as long as you don't mind getting out the toolkit and removing a few bolts. But even in the lower position, the screen is as high as most people will want. There's just a hint of buffeting, but nothing that tired me. The same can't be said for the seat. Owners of the DL1000 V-Strom seem happier with their seating accommodations. 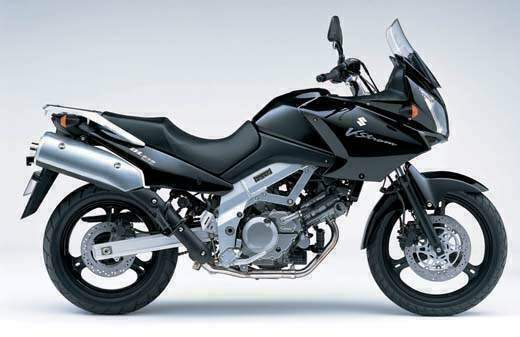 I suspect Suzuki was aiming at making 650 buyers feel comfortable about getting both feet on the ground, but the soft, smallish seat is the weak point in high-mileage days. Passengers actually get a broader, more comfortable place to sit. Off pavement, the V-Strom is a little too heavy and a bit lacking in suspension travel for truly hazardous duty. On pavement, a bit more power from the front brakes would be nice on the street. But then again, the suspension is calibrated to work well where the bike spends most of its time, on asphalt, and the brakes are set up to perform in a variety of conditions, including dirt roads and crumbling pavement. What you get in exchange for these minor compromises is a bike that will be 80 percent as comfortable as a dedicated sport-touring bike on the highway, and 80 percent as competent on dirt as a street-legal dual-sport thumper. If you're the type of rider who spends most days on pavement, but relishes the ability to turn down a dirt road on a whim, just to see what's there, the V-Strom will hit your sweet spot. You can fine-tune the bike even more precisely to your needs with a few accessories. 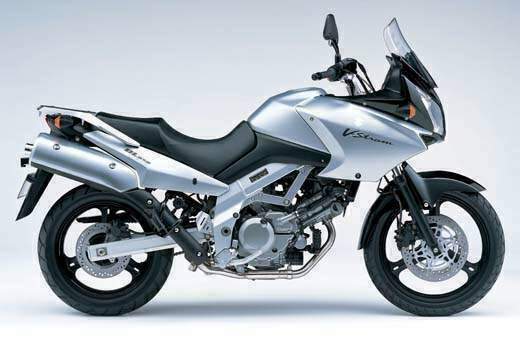 The V-Strom becomes more tour-worthy by adding Suzuki's optional color-matched saddlebags and a top case. With the bike's standard luggage rack, adding an aftermarket top box would also be a simple matter. The aftermarket also supplies items to make the V-Strom more off-road worthy, such as bash plates, handguards and engine guards that protect that big fairing in case of a tipover. The price for the V-Strom's versatility is relatively modest: MSRP is $6,699.